Pinot Noir with its characteristic moderate tannin levels and heightened acidity is a widely versatile wine when it comes to food pairings. The signature flavor profile of Pinot Noir is strawberry, raspberry, black cherry, and floral hints of dark roses and violets. Oaked versions include additional vanilla, clove, and smoke aromas and flavors. With age, Pinot Noirs develop an earthy, dried mushroom and barnyard profile. Also, due to being naturally a thin-skinned grape variety, Pinot Noirs tend to have softer, lighter tannins and are generally paler in color than most other reds. 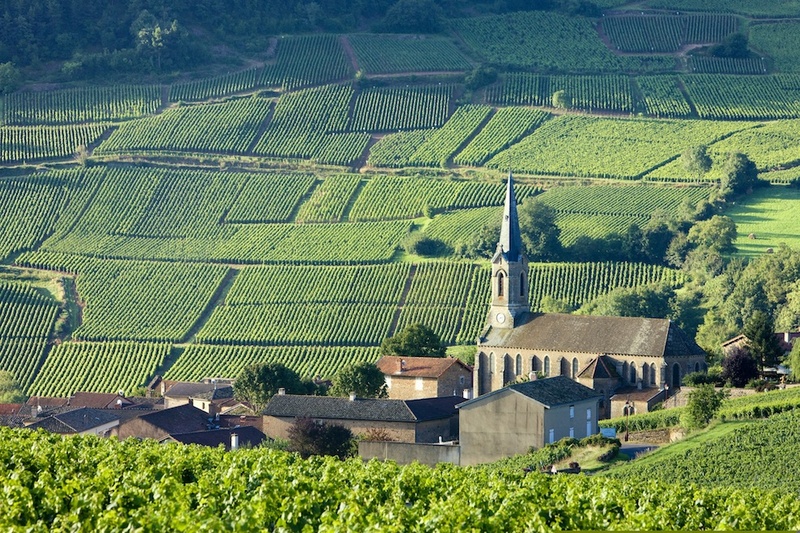 Pinot Noir (also known as Red Burgundy or Bourgogne) vines bask in the sun in Vergisson, Burgundy, France. Fruitier, less tannic styles of Pinot Noir pair extremely well with richer fish dishes, such as salmon or halibut, as well as creamy pasta dishes. The higher levels of acidity in the wine will cut through the richness of the food and lighten the mouth feel. The bright fruit and vibrant acidity also pleasantly act as a palette cleanser. Earthier, more tannic styles of Pinot Noirs match very well with grilled meats such as chicken, pork, venison, duck and other game birds. The tannins in the wine will bind with proteins in the meat, softening the mouth feel. And the smoky, earthy, meaty flavors in the wine will complement and accentuate the gamey, smoky aromas and flavors of the dish. Stews, root vegetables and mushrooms also make for great pairings with Pinot Noirs. These foods tend to have heightened levels of umami — savory, bold and flavorful taste — that are balanced well by higher acidity and lower tannins. Umami-rich dishes are known to increase the astringency and bitterness of tannins in wine, thus making a moderately tannic, vibrant Pinot Noir an ideal pairing. Joanna Wyzgowska is a WSET Diploma graduate (June 2016) who is currently working as a sommelier at the Craft Restaurant in New York City. Joanna is also a Certified Sommelier from the Court of Master Sommeliers. I like this article. Very clear explanation and educational. I like this page!